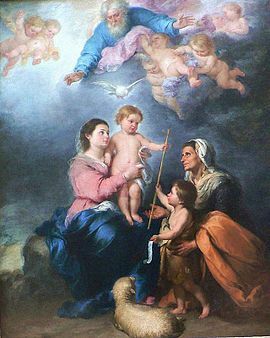 God the Father and the Holy Spirit with a young Jesus, by Murillo, c. 1670.
the heart of him who loves him and promises him birth. What does power avail us? We do not want to rule. We want to live, we want light and warmth, and hence we need yours. Just as the greening earth and every living body needs the sun, so we as spirits need your light and your warmth. A sunless spirit becomes the parasite of the body. But the God feeds the spirit. ~Carl Jung, Red Book Page 286.